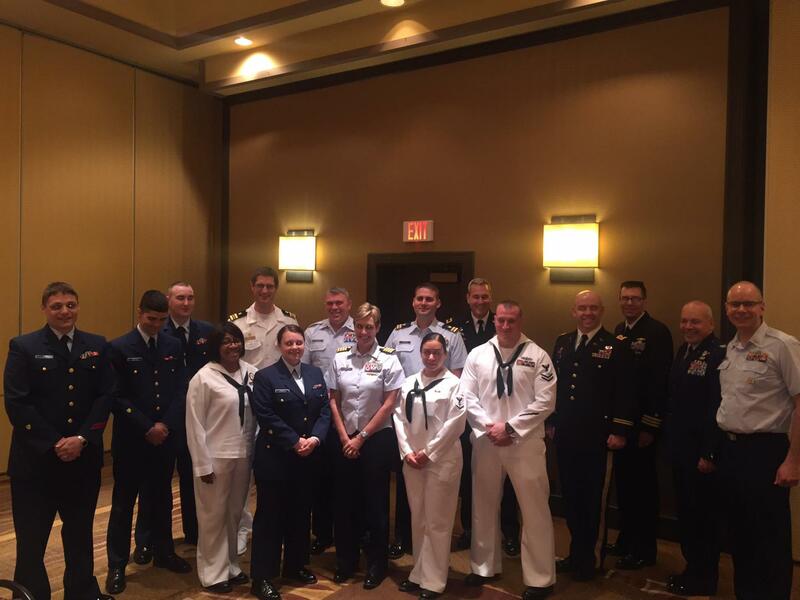 Each of the five branches of the United States Armed Forces was represented over lunch at the Four Points Sheraton during Armed Forces Week. Highlights included the importance of hiring veterans as a great way for businesses to honor those who have served. Thank you all for your service. You're the ultimate example of the Rotary motto, Service Above Self. 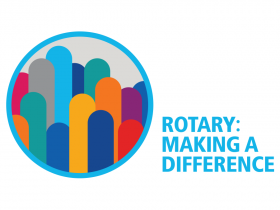 This week we have a “Rotary on The Move” to Goodwill Industries at 6055 North 91st in Milwaukee. Park on the south west side and use the corporate entrance, not the store. Goodwill is providing us with lunch and a tour of their sheltered workshops. Club members are encouraged to bring a donation of gently used clothing or household goods. The meeting will begin at noon and end by 1:30PM. This week our speaker was County Executive, Chris Abele. This was his fourth appearance at our club. Chris was impressed with our club and its volunteer ethic and the fact our club really cares about our community. He stated that he wished our politicians and public servants measured themselves against the Rotary Four Way Test. This year Chris Abele is presenting his fourth budget since becoming our County Executive. He has made tough decisions and increased the efficiencies and productivity within the County Government resulting in a deficit of $14 million dollars, down from a projected $67 million dollar shortfall. He explained that there are forty-one different business lines within the County. He has hired leaders who believe “public service is an honorable thing” and desire to get involved and make it better. He referred to the latest PBS special on the Roosevelts that used examples of how they made tough decisions and take on tough positions. The County Executive used the House of Correction as an example on how they have taken on tough situations and made them better for the County and the inmates. They made major changes after taking over the responsibility from the Sheriff's Department. They now have a print shop and a recycling program. The inmates have achieved 31,000 days of work on County projects which has resulted in reduced sentences for the inmates. They have also introduced job skill training. Chris also addressed the sale of County property to private interests for development which would produce increased tax revenues and reduce the expense on maintaining those properties. Examples he used were the Downtown Bus Barn and the McDonnell Park garage. NML will take over the garage’s maintenance and liabilities, while the Bus Barn is being sold to a developer to build a retail and luxury apartment complex. Our guests this week included past Rotary presidents, Bob Huber and Tom Brown. Dedra Walls and daughter Devin attended as guests. Brandon Conway, Communications Director of Milwaukee County attended as did six members of the local media. We are continuing to feature “History Tidbits” as we approach our sixty year anniversary in March of 2015. We will be discussing the formation of a 60th Anniversary Committee at our board meeting. John German has agreed to be our master of ceremonies for this event and has asked that the club’s past presidents consider joining the committee. We need additional volunteers to assist with the selecting of the venue and the planning of the anniversary party. During the 1964-1965 year, Kenneth W. Graves was the club president. Kenneth Graves represented the club at the International Convention in Atlantic City in May. The club membership grew to 58. Brian Guerin is already planning the annual Pancake Breakfast and will be asking for volunteers to assist in serving the food, maintaining the tables, getting sponsors and selling tickets. 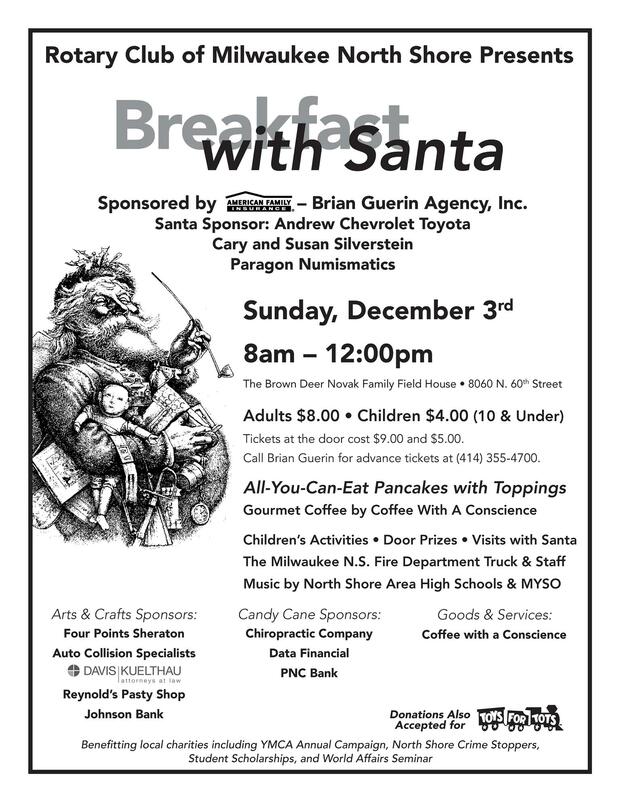 Before you know it we will be ringing bells at Bay Shore and serving pancakes at the Brown Deer field house. This week our speaker is our County Executive Chris Abele. He will bring us up to date on what is happening in Milwaukee County politics. Next week we have a “Rotary on The Move” at Goodwill Industries. The Goodwill staff are providing us with lunch and a tour of their sheltered workshops. The address is 6055 North 91st Street. Club members are encouraged to bring a donation of gently used clothing or household goods. Our speaker last week was Dr. Sam Wann, a physician at Columbia St. Mary's Healthcare. He is working with colleagues using CT scanning to investigate heart disease in ancient human mummies in South America, Northern Europe and the Middle East. He and his colleagues have found that these ancient individuals, both wealthy and poor suffered from the same cardiac complications. The same calcium deposits in the arteries of peasants in Peru were present in the Kings and Queens of Egypt. They were also present in the arteries of the “Iceman” found in Northern Europe who was over five thousand years old. The doctors hope that their research will lead to new drugs that will reduce the potential of this calcium build up in our arteries. Our guest this week was Heather Williams from the Philadelphia YMCA. It was a pleasure having her back for lunch. We are continuing to feature “History Tidbits” as we approach our sixty year anniversary in March of 2015. John German has agreed to be Chairman and our master of ceremonies for this event. We need volunteers to assist with the selecting of the venue and the planning of the anniversary party. During the 1963-1964 year, George Southworth was the club president. For the first time the club featured a team in the Glendale Bowling League. The club sent a delegation to the International Convention in Canada, The club membership remained at 48. Deb Kerr reported that this year’s Lobsterfest took place on September 13th at Shelly’s in Mequon. It was a “crustacean sensation”. This year’s Lobsterfest was a smashing success. We raised over $30,000.00 for clean water and other Rotary focuses. Each table was challenged to raise money to build wells in Africa that would provide clean water. It was stated that every eighteen seconds a child dies from water borne diseases. We have almost eliminated Polio, now is the time to help provide clean water, something we take for granted each time we turn on the faucet. The tables raised over seven thousand dollars for one village. That will provide a pump, storage and the clean water they need to support the village’s needs. Thank you everyone for being so supportive of this event with your attendance and donations. Guess you had the most colorful table at the event? Ask and we will tell you. Next year the Lobsterfest will be on Oct 3, 2015. This week our guest speaker will be Jorge Franco from the Hispanic Chamber of Commerce. He will be speaking about their new skill training program they introduced this year for welding training. Edward Panelli the Global Managing Director from Miller Electric who is a major supporter of this program will assist Jorge in the presentation. We will be inducting Bill Brown into our club during our Monday meeting. Please give him a hardy welcome. Last week we had a Rotary on the Move to the Rite-Hite Family YMCA in Brown Deer where we were hosted by their staff and Sonya Coster, Vice President of Strategic Programing. We met at noon at the southern end of the Rite-Hite Family YMCA in their outdoor pavilion. The sandwiches, desserts and beverages were provided by the Outpost. We were entertained by a group of campers and staff. Guests included Annie Muehlbauer (Bill Brown invited) and Ellie Goldstein, Mark's daughter. At club meetings, view RI President Gary Huang’s Membership Video Message to remind members how important membership is to maintaining a strong and active club. Connect with Rotary’s Facebook page and change your Facebook and Twitter profile pictures to the I’m a Proud Member graphic to show off your membership to friends, family members, and colleagues in your social networks. Post photos of your club doing good in your community to Facebook, Twitter, and Instagram using the hashtag #WeAreRotary. 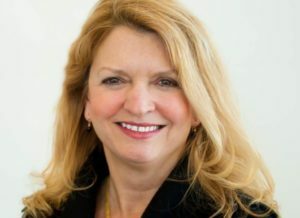 Register for the August 13th webinar Membership: It’s Now or Never, the first of our Membership Matters Webinar series. We are continuing to feature “History Tidbits” as we approach our sixty year anniversary in March of 2015. We will be forming a 60th Anniversary Committee in the near future. John German has agreed to be our master of ceremonies for this event. In 1957 the club participated in the organization of Rotary Council of Milwaukee County. Our club contributed to Milwaukee County orphans through the “Hansel and Gretel” program. In February of 1957 members of the club and their wives went to Random Lake and had an ice fishing party. Also in February of 1957 a Valentine party was held for the Rotary-Anns. John Godfrey was elected as president for the 1957-1958 Rotary year. Do you and your family have room in your heart and space in your house for an Exchange Student? Three Host families are needed to sign up NOW, each to welcome and house Rotary’s incoming exchange student arriving from Thailand in August 2014. Each Host Family will serve for only about four months between August 2014 and July 2015. If you are interested, please contact Terry Machut.